Puffer ™ is a general purpose encryption utility that is used to protect your most sensitive data from unauthorized viewing. 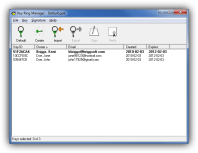 You can use Puffer to securely exchange email with other Puffer users, compress and encrypt your data files into zip-style PUF archives, use steganography to hide data among the pixels of image files, and distribute self-decrypting archives to non-Puffer users. Extensive wiping options are also available to permanently erase sensitive data. The 25-run trial version includes an installation routine that will place all the program files into a directory of your choice and will add the appropriate shortcut icons to your start menu. No device drivers or other runtime modules will be modified or added to your system directories. No adware, spyware or any third-party programs will be installed on your computer. You may remove the program at any time with the built-in uninstall routine. Exe format (puf32.exe, 2.0 MB). Download and run to start the installation. Zip format (puf32405.zip, 2.0 MB). Setup file wrapped in a zip file. Order the full licensed version of Puffer for $34.95 from the Order Form page. Multi-user site licenses are also available. Version 1, 2, and 3 license holders can contact Kent Briggs for instructions on how to upgrade to version 4 at 50% off the regular price. Upgrade Patches - Licensed customers can self-upgrade to minor version changes using a patch program. Major version upgrades are available to licensed users at a 50% discount. Contact Kent Briggs for ordering instructions. Program changes are listed in the revision history file. Puffer 3 Decryption Module 1.01 - Puffer 4 archives are not compatible with previous versions. Use this free utility to decrypt version 3 archives: p3d101.exe v1.01 (490K). Frequently Asked Questions - A FAQ file for Puffer is available here.